Dynamic and truthful, inspirational and wise; Iyanla Vanzant, author, orator and authority on spirituality from an African perspective, delivers a soaring message of faith and empowerment to Black men and to their mothers, daughters, and wives. Long known as the country’s leading authority on spirituality and empowerment of Black women, Iyanla Vanzant now offers a message of faith, self-knowledge, and courage for Black men in struggles, crises, and victories we face in today’s society. 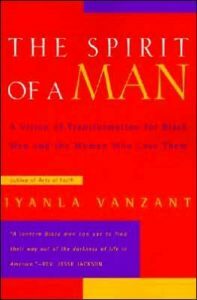 Teaching Black men to recognize and tap the energy of our own spirits, Vanzant uses a brilliant and transforming blend of ancient African spirituality, practical self-help advice, and contemporary faith to help Black men—and the women who love them—nurture the strength and power that are our birthright. I am a 21-year-old black man, who for so long knew that there was more to life but could not figure out what it was. Months of searching lead me to realize that I had to become more spiritual. I went on to read numerous books on spirituality and self-improvement, but after learning these principles I had no way of applying them. This book showed me how to apply what I had learned and also taught me a lot more things about life and my relationship with the Creator. This book is a must for every black man or woman who is at the entrance of the tunnel, sees the light at the end, but does not know how to walk through. Iyanla took my hand and I’m sure she’ll take yours. After she has lead you to the light, you learn the ultimate lesson: you have been and will always be able to lead others through this tunnel.